So every once in a while, FingerPaints comes out with new core collection polishes. Today I have 5 of 10 new ones for 2015. The other 5 will be on the blog later this week. The first one I have to show you is called You Can Crayon My Shoulder. It's sort of a jelly glitter polish and is absolutely gorgeous for Spring and Summer. This is opaque in 2 coats - shown here is with no top coat. Still Life Strawberry is a gorgeous hot pink glitter topper. Yes, even though I'm not a pink fan, this is sooooo pretty! I just love how much it pops over black! Violaceous Vase is a pretty shimmer/glitter combo polish. So far, FP is the only brand that I have that has a bunch of polishes like this. You either like them or not like them. I'm leaning towards the liking them side but some days they just don't do it for me. This is 2 coats and no top coat. 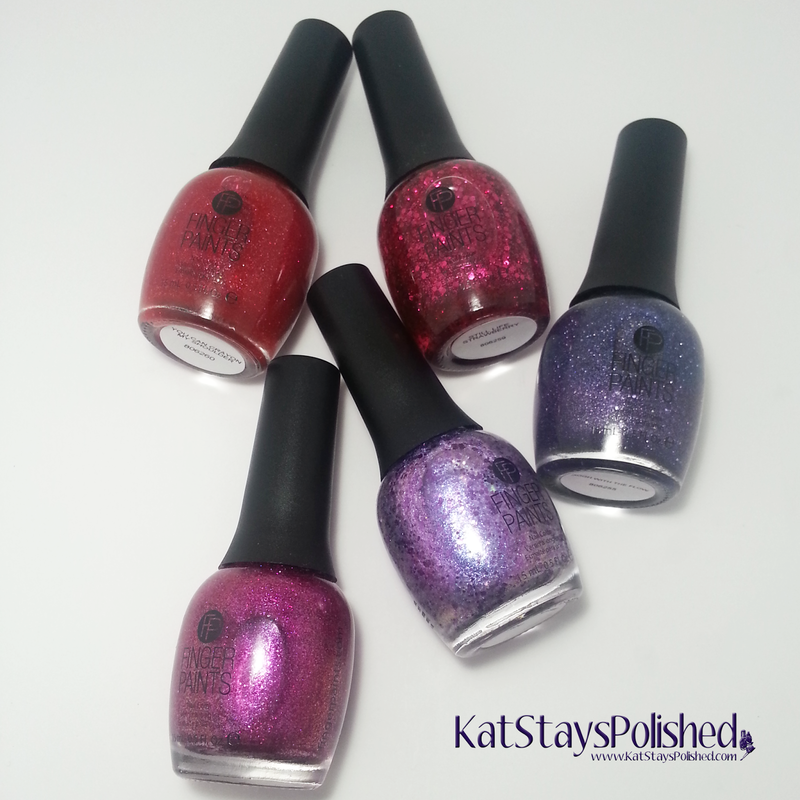 Color Me Abstract is a beautful Fuschia-toned glitter/shimmer polish. Shown below is 2 coats and no top coat. I love how this applied and if you're in the mood for something bling-y, this is it! Last one for today is Gogh with the Flow. This almost has the consistency of a textured polish. I don't think it's meant to be, but I took my pictures with no top coat to show you what it looks like. It isn't as gritty as some textured polishes are but because it's full of a lot of glitter, it won't dry smooth unless you apply a top coat. I really lvoe this color. So what do you think of these new colors for 2015? Like I said, I will have 5 more on the blog later on so stay tuned!